The brief for the Clifford Electrical Site was to create a professional, attractive, informational website raising awareness of their business and the range of services provided. All pages display contact information, logos for accreditation and membership to professional industry organisations, social media icons for Facebook, Twitter and Google+. The logo was designed by Pedleyonline with guidance from Clifford Electrical. Good on-page optimisation in use and off-page SEO activity includes use of social media, Facebook, Twitter and Google+. Pedleyonline assisted with the set-up and styling of these various business pages, ensuring their consistency with the website and Clifford Electrical branding and providing links back to their website and also from the website to social media. 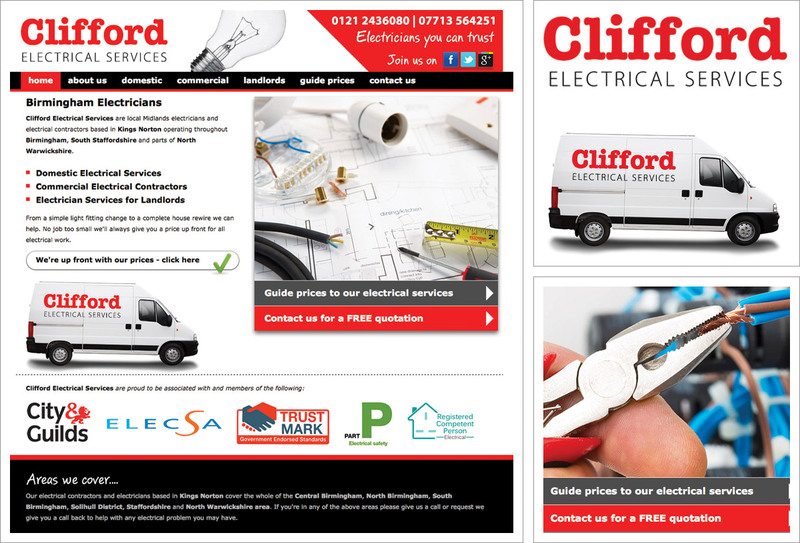 Read more about Clifford Electrical Services on our Web Design Blog. “Brian (Pedleyonline) is refreshingly different in his approach. Having completed our initial consultation with Brian I was impressed with his ideas and his realistic approach. His extensive portfolio of previous work is clear demonstration of his talent and what we might have expected. He didn’t promise the earth like others and explained the various processes and stages from concept to delivery. I really liked the fact that if I had a question I could simply pick up the phone or email him directly, you don’t get bounced around the studio and passed from pillar to post. We received the initial quotation, a simple and cost effective solution with outlined expectations. I would say don’t overlook or mistake his cost effective solutions for below par websites. Pedleyonline are affordable and extremely cost effective. Pedleyonline delivered the new site in a few weeks as expected and we are extremely happy with the end result. The site has bedded in well and is performing as expected. We have received positive feedback from our customers with many choosing to call us rather than our competitors purely down to the professional look of our site.